Tu b'Shvat illustration courtesy of JCC This New Month project. Just as the new moon is but a sliver filled with potential when we celebrate her arrival each new month, the contracted season of Winter is the time for us to commemorate Tu B’Shvat – the new year for trees. In Israel, buds are just beginning to appear on the branches of the almond tree, but here everything waits, wondering when the frost will start to thaw. One of the four New Years in Jewish tradition, Tu B’Shvat ---- the fifteenth of Shvat, the fourth month of the Jewish calendar --- was originally a sort of tax day, a day to mark the legal age of fruit-bearing trees for the collection of tithes on their fruit. Over the millennia, Tu B’Shvat has evolved into a Jewish Earth Day of sorts, with tree planting as a core custom, and as a time for us to attune our awareness to environmental and ethical issues dealing with consumption and sustainability, in large part connected to our relationship with food. Eco-kashrut, or ethical kashrut, has expanded the idea that a kosher diet be more than just the halachically right way to eat. Those who embrace this higher way of kashrut are concerned with the connections between the food we eat and issues of social justice, community vitality, health and nutrition, workers’ rights, and how we treat the earth. At the Second Annual Hazon Food Conference, at the Isabella Friedman Conference Center in the Connecticut Berkshires last month, participants shared four days with leaders and innovators in the new Jewish food movement exploring the connection between food justice and the choices we make about food. The kabbalists of 16th century Sefat in Northern Israel created a mystical seder for Tu B’Shvat, modeled on the Passover seder. The Tu B’Shvat seder involves drinking four cups of wine or grape juice, as in the Passover seder, and eating up to fifteen different fruits, which include the seven fruits mentioned in the Torah: wheat, barley, dates, figs, grapes, olives, and pomegranates. Prayers are said that enhance our appreciation for trees and fruits and, often, the four mystical worlds of the kabbalah are invoked. What, though, is the significance of the word "Tu" meaning fifteen? In the Tu B’Shvat seder created by The Shalom Center, Rabbi Phyllis Ocean Berman teaches that we say "Tu" (Tet-vov; adding their numerical values 9 + 6, instead of adding 10 + 5, which would be Yod-hei) as a mask to avoid invoking the Name of God. "Do we need the mask?" she asks. "What would happen if we said ‘Yah B'Shvat’? What would it be like to see and say that on every full moon, ‘Yod-hei’ is fully present? Would we bring Mashiach (Messiah)?" I now share with you some dishes that bring the seven fruits of Israel to your Tu B’Shvat table. I think you will enjoy them all year long. Wishing you a joyful Tu B’Shvat and a warm and cozy winter. Pomegranate Chicken. Recipe and photo courtesy of POM Wonderful, Inc.
Place oil in a large skillet; brown chicken pieces in batches with carrots and onions for 5-6 minutes or until tender, stirring frequently. Remove chicken breasts. Keep vegetables warm. Place broth in a pan and add back chicken; cover and simmer for 10-15 minutes, or until cooked. Reserve 1/3 cup of chicken pan juices. Transfer chicken and vegetables to platter; cover and keep warm. Put reserved 1/3 cup of pan juices in skillet. Stir in pomegranate juice, balsamic vinegar, cornstarch, brown sugar, herbs and seasonings. Bring to a boil; reduce heat and simmer for 2 minutes. 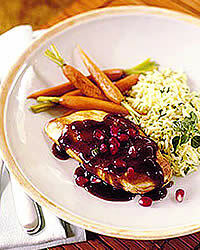 Drizzle some of the sauce over chicken and vegetables; garnish with reserved pomegranate seeds. This pretty high-protein salad is adapted from one created by Chef Martin Breslin of Harvard University dining services. Place wheat berries and barley in large pot with vegetable stock to cover. Simmer until tender, about 45 minutes to 1 hour. Drain and chill. Mix chilled grains with figs, grapes, peas, red onion, and thyme. Toss with 1/4 cup honey vinaigrette. Season to taste, chill and serve cold. Whisk together vinegar, honey, mustard and salt. Slowly pour in oil while whisking to form an emulsion. This flavorful spread is so easy – just three ingredients – and makes a great accompaniment to challah. Add all ingredients to the work bowl of a food processor and pulse until the mixture is well combined but not pureed. Pour boiling water of the chopped dates and let cool. In a separate dish cream the butter or margarine and sugar, add the eggs and beat well. Add the vanilla extract and baking soda, then mix in the cooled dates with water.